A native of New York State, our Pastor, Daniel Benton, was saved in his senior year of high school. After high school, he earned a Bachelors Degree in Psychology and Social Work from Western New England College (now Western New England University) in Springfield, MA (1982). During his college years, Pastor Benton served in various ministries of Grace Baptist Church in Springfield. 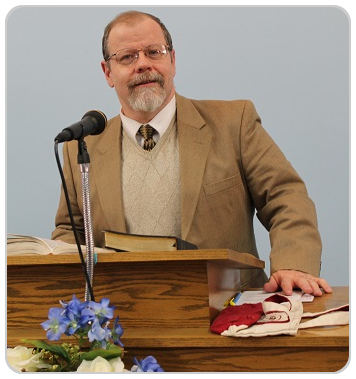 After college, the Lord called him into the Ministry and he began training at Heritage Baptist Institute, graduating with a Diploma in Bible and Theology (1988). At Heritage Baptist Institute Pastor Benton met his wife, Vicki, a native of Maine, who was the school’s secretary. The Bentons married in June of 1984, and have three grown children. Following graduation from Heritage Baptist Institute, Pastor Benton preached throughout the Northeast, providing pulpit supply for churches from Maine to Pennsylvania. In 1990 he was called to be the Pastor of Berean Baptist Church. Pastor Benton is committed to communicating the Word of God as effectively as possible through expository and topical preaching, relevant teaching, as well as individual and group Bible Studies. He is also a qualified Counselor with extensive experience in both individual and family settings.